Madrid has many diverse and active markets that are not mere marketplaces to buy food for you household. Markets have had to modernize into social centers in order to not disappear in the last decades, as supermarkets have eliminated the need for them. Even so, Spanish people have a strong culture of buying household food at the market — the better quality and personalized service is what attracts the locals. Meanwhile, markets have adapted by becoming ecosystems of bars and places to try fresh food. El mercado de San Fernando is one of the many markets in Madrid. Then there’s Mercado de la Paz, Mercado de Maravillas, Mercado San Antón, Mercado San Ildefonso, Mercado de la Cebada, among many others. El mercado de San Fernando is my favourite due to its atmosphere. 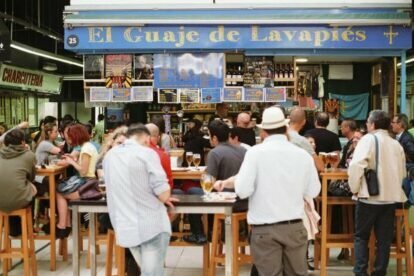 Since it’s located in the emblematic neighbourhood of Embajadores / Lavapies, the market has inherited the alternative and informal attitude that’s characteristic of the neighbourhood. El mercado de San Fernando is a mixture of traditional establishments and modern spots. Therefore you can find classic old school tapas, sushi, Peruvian or ramen. You may get lost in their corridors full of spots with different specialities. My favourite place is the center, where there is an open space where the action is. Youngsters sit on the floor and kids run around. On weekends there is more life. A tip would be to drink and snack during the day and finish off the evening in La Tabacalera.